Enterprise Rent-A-Car European IT director Jeff King is not the kind of individual who shies away from a challenge. After overcoming the odds, and rising from the firm’s shop floor to an executive position at head office in the US, King has spent the last two years directing IT across Enterprise’s European business. The executive has set in place key partnerships to help the organisation make the most of technology. Those partnerships cover internal IT professionals across Europe and external arrangements with third-party providers. He has already put strong technical foundations in place, yet there are more tests to come. “We’re growing so fast that it presents a lot of challenges,” he says. 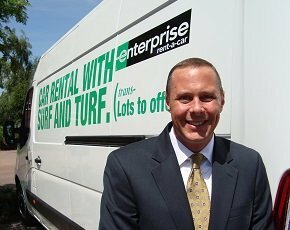 Michigan-born King moved to St Louis after leaving university and joined Enterprise Rent-A-Car in a temporary role 22 years ago. He started working on the shop floor, dealing with customer car rentals. After moving to head office, and moving around a series of IT- and business-related positions, King was approached about a job in Europe in 2012. Enterprise Rent-A-Car has grown significantly during King’s two years in situ and is now present in most European nations, often via partnership agreements with established local rental firms. Most of these providers use their own IT systems but there also needs to be some level of integration, especially with invoicing, billing and reservations. “Our IT team is consultative,” says King, suggesting that the firm uses its operational scale to help support European operations. That consultative process continues and King says his attention will focus on two key areas during the next six to 12 months: Cross-European project management and balanced service relationships. As well as its UK office, Enterprise’s European IT department has teams in Spain, France and Germany. King says the individual offices have often operated as separate silos. He is keen to find ways to promote closer ties between the teams and create a single European IT organisation. “My vision is we reach a point that, rather than being confined to their own areas of work in their own regions, the team can share the IT workload of the European business evenly and consistently,” he says. His move towards this aim has been assisted by the completion of a pan-European IT cost analysis tool - the development of which represented the first cross-region project. King says the initiative, which started in the summer, involved key IT professionals from each European base. The team completed its collaborative development work in the cloud, using the .Net development framework and agile methodologies. The project has been a success, offering some important pointers for future developments. However, King recognises that it has been more difficult to create pan-European project teams than might have been anticipated. He discovered that each regional IT team had its own ways of working. While working with .Net, for example, provided a comfortable common platform, King and his team found that each country ran its own version of the framework. Licensing issues, therefore, had to be sorted. King and his colleagues also had to find consistency across agile working methods. While English provided a common vocabulary, King found there were often minor misunderstandings in regards to terms and terminology. “Small, simple phrases can trip people up,” he says, suggesting cultural variations between states provide another challenge. The key to cross-country collaboration can be surprising. King says that instant messaging, rather than expensive social tools, has been crucial in helping people around Europe to keep in touch. “Simple systems are often the most effective,” he says, adding that the importance of face-to-face meetings can never be understated, particularly during the early parts of an initiative. “We’ve still got more to do in regards to the way these projects are created but it is encouraging that we have found a means to collaborate effectively. Once we got through some of the tool and policy concerns, we established a rhythm of working. The great news is that we’ve established a common platform in terms of methodologies and technologies,” he says. He has already established key relationships and calls on BT Business for a series of managed services. These include mobile and landline phones, the branch network across different European regions, wireless networking and datacentre hosting. BT Business also provides assistance with fulfilment and the roll-out of new Enterprise branches in fresh locations. King says Enterprise Rent-A-Car in the US has a long history of developing in-house IT. The European business can draw on this applications legacy, yet King is eager to see how external experts might help him meet business objectives. King says Enterprise is using supplier T-Systems to help with technical support in Europe. He says the IT specialist can help the firm deal with increases in call volume. The fast growth of the firm across the region means flexibility makes sense. “We’re looking to work with local vendors who are professionals and who we can educate about the demands of the business,” he says. When it comes to the future of the IT department, King expects more technology professionals to develop their customer relationship skills. He says that, in the long term, the IT organisation will be a service centre and technology workers will need to act as skilled integrators and orchestrators. “The IT department of the future will be slimmer,” he says. “Many IT people will spend their time project-managing external partners and creating internal services.” King already has an eye on future developments. He and his team are exploring developments in telematics and mobile, and he suggests an innovative combination of technology in these areas could help create significant changes in car rentals. At a basic level, data from in-car telematics systems can be used to keep a real-time feed of how far a particular rental car has travelled and how much fuel has been used. Smartphones, meanwhile, can be used to help expedite the creation of car-sharing models in individual businesses. By becoming a regular customer, King expects clients to be able to use apps on their phones to self-serve. Rather than having to queue at an airport, regular customers will be able to use their apps to sign-in via their phones, collect their cars and drive off.